ACE Wire Rack offers you a convenient method of storing your wire, plus an efficient material handling system for feeding wire up to size No. 14 from buckets or reels.Wires are guided through eyelets to the two frontconsole panels, where sizes are clearly numberedfor ease in selection of wire size, and are immediately ready for use. Model 41 offers a 24 pail capacity. Model 42 offers a 40 pail capacity. 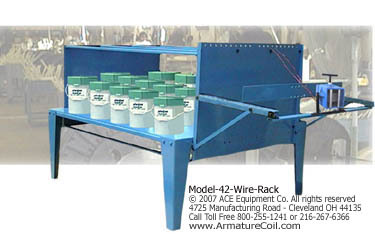 ACE Equipment Company has designed a unique scale system for weighing magnet wire stored on a wire rack. The scale system comes with a meter which allows a customer the ability to weigh and calculate the total amount of wire stored on their wire rack. 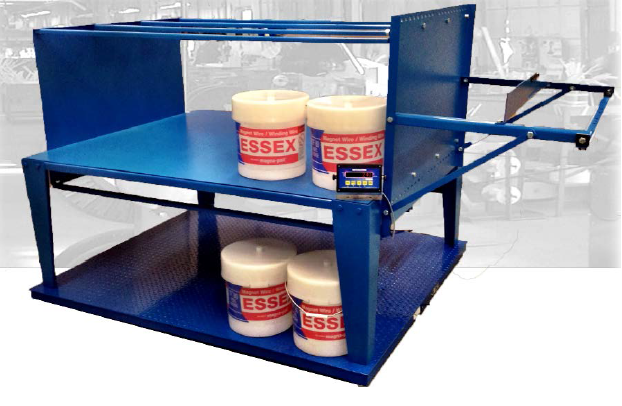 The scale system can be used with any wire rack that will fit on the scale. 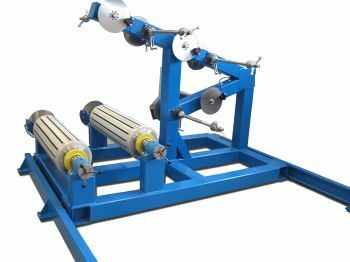 Air-operated tension system with on de-reeling unit offers remote tension control which eliminates spool roll-in when de-reeling has stopped. Operator can conveniently vary tensionat the winding machine. Tension applied by air-actuated calliper brake gripping a 12” disk. Model 432-1B provides two shafts for de-reeling up to 4 24” reels. Optional accessory equipment: two or more brakes, 18” disk, Dual Pressure Control Valve. 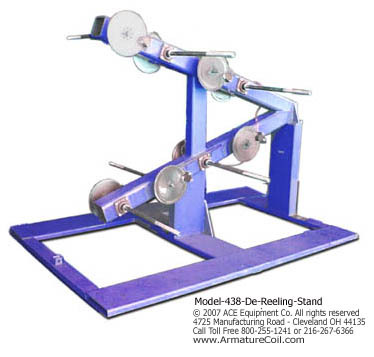 Multi-Reel wire rack offers you a convenient method of storing reels of wire, plus an efficient material handling system for feeding and tensioning wire from multiple reels. 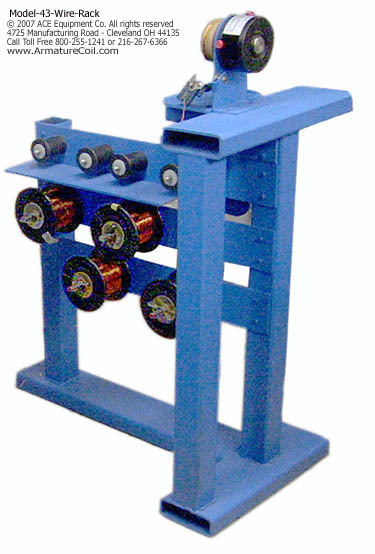 Wires without any knots or damage are crucial to efficiently run coil winding processes. ACE offers multi-reel wire racks to secure wires of any lengths and dimensions. Available in Model No. 43, this easy-to-use unit can store reels of wires without tangling and stretching. Designed with eight de-reeling units on one tension stand. Ideal for customers with limited floor space. 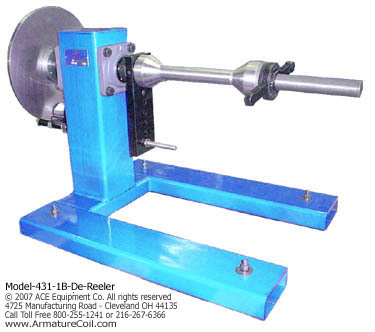 The model 438-1B de-reeling and tension stand is an air actuated caliper brake exclusively designed to provide remote tension control, supporting coil winding processes substantially. 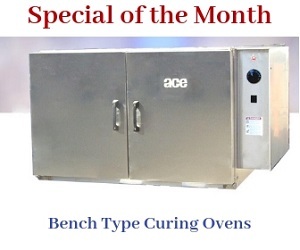 ACE offers many custom designed types and sizes of Mandrel configurations, De-Reeling & Tension Stands, Carriages and Tension Devices for various winding applications. Mandrels collapse for ease of coil removal.